We’re getting very close to the big 50th anniversary of The Man and the Hour now and the pace is is picking-up. You have to feel sympathy for Rev Timothy Farthing, given the hand that fate dealt him between 1939 and 1945. 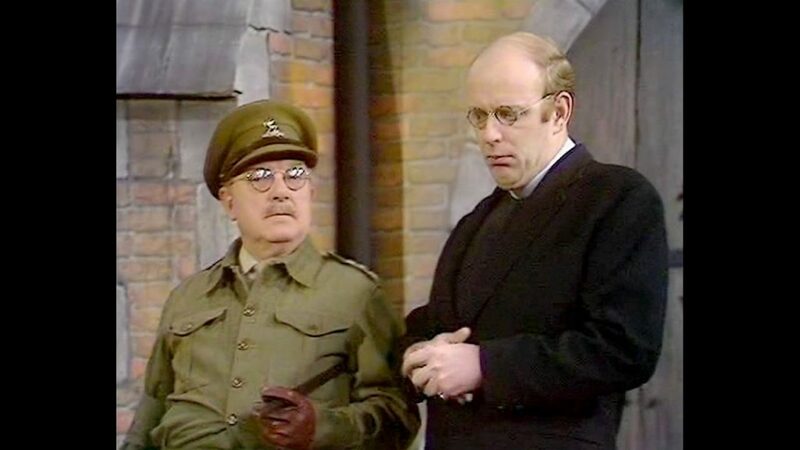 He may be a tad fussy and a bit grumpy, but if your office and hall were regularly invaded by Mainwaring and his men, and you had to deal with Hodges’ complaints how would you react? Boot-marks on the polished boards are one thing, but a desecrated harmonium is quite another. There are some questions as to why the Vicar needs a harmonium at the top of his bell-tower and how he managed to get it there. A more urgent question is why the verger is hanging around outside the window. But the really pertinent question is, just exactly what has been written on the back of the instrument? It is clearly something exotic as Pike doesn’t know what it means and Jones hasn’t done it for some time. Sadly the mystery is never revealed but as this is family viewing, perhaps that is just as well. This entry was posted in blog on July 25, 2018 by wolAdmin.